On the 2nd (Sun), get in on the family fun at Universal Studios Hollywood. For other places to visit, photos, traveler tips, and tourist information, use the Los Angeles vacation planner. Use the Route module to find travel options from your starting location to Los Angeles. Expect a daytime high around 79°F in June, and nighttime lows around 62°F. Cap off your sightseeing on the 2nd (Sun) early enough to go by car to Pismo Beach. Pismo Beach is a city in San Luis Obispo County, in the Central Coast area of California, United States. Kick off your visit on the 3rd (Mon): get some thrills on the water with a speed boat tour. To find ratings, traveler tips, reviews, and other tourist information, go to the Pismo Beach day trip planner. Traveling by car from Los Angeles to Pismo Beach takes 3.5 hours. Alternatively, you can fly; or take a train. Traveling from Los Angeles in June, you can expect nighttime temperatures to be slightly colder in Pismo Beach, with lows of 53°F. Wrap up your sightseeing by early afternoon on the 3rd (Mon) to allow enough time to drive to Morro Bay. Morro Bay is a waterfront city in San Luis Obispo County, California located along California State Route 1 on California's Central Coast. To find maps, other places to visit, reviews, and other tourist information, read our Morro Bay online vacation planner . Morro Bay is very close to Pismo Beach. June in Morro Bay sees daily highs of 78°F and lows of 53°F at night. On the 3rd (Mon), you're off toSan Francisco. 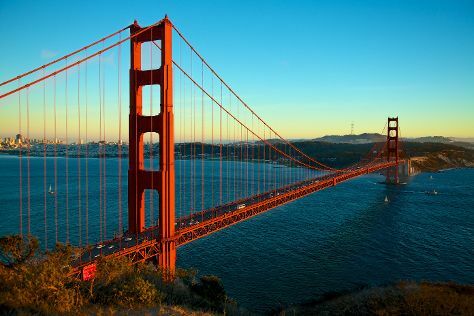 Kick off your visit on the 4th (Tue): step off the mainland to explore Alcatraz Island, then take in the pleasant sights at Fisherman's Wharf, then don't miss a visit to Lombard Street, and finally take in the views from Golden Gate Bridge. Get ready for a full day of sightseeing on the next day: get curious at Exploratorium and then don't miss a visit to Golden Gate Park. To see maps, traveler tips, ratings, and more tourist information, use the San Francisco trip maker app . You can drive from Morro Bay to San Francisco in 4.5 hours. Alternatively, you can fly; or do a combination of bus and flight. While traveling from Morro Bay, expect slightly colder days and about the same nights in San Francisco, ranging from highs of 71°F to lows of 55°F. Finish up your sightseeing early on the 5th (Wed) so you can travel back home.